Power Cut Line has a full range of sizes and specifications for cutting steel, stainless steel, aluminum and non-ferrous metals. 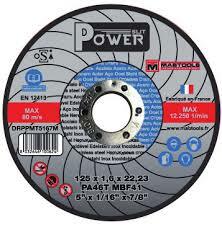 Discs are available for portable cut-off machines and angle grinders. Great cutting capability, comfort and clean cut are the main advantages of thin wheels, making them the perfect choice. One of the key features of Power Cut series products is the cold cut that prevents thermal deformation of the workpiece.